Italian Eternite Line - Sell - Italy Agami Srl. Properties: Cleansing Milk with soothing properties with Omega Blue and Sensiline ( line seed extract ) for a strong calming and anti-rouge action. Skin Type: Suitable to intolerant, sensitive and reactive skins. Use: Cleanse face/neck, morning and evening. Properties: Intensive cream with visible calming and clearing effect, able to remove in a short time the unpleasant redness look, typical of sensitive skins, also with couperosis. With Omega Blue, horse-chestnut, hops and chamomile ( matricaria ) soothing extracts. Skin Type: Suitable to sensitive skins. Can be used together Behind your with Rose Water and Elisette Mask. Use: Apply every day before make up. Properties: Calming mask, suitable to delicate and sensitive skins. Soothing and decongestive action,excellent also for the treatment of couperosis. With a rich compound made of: sorbitol, glycerin, linseed extract, seawater, seaweeds. Skin Type: Sensitive/delicate skins, easy to get irritated. Also with couperosis. Use: Apply 2 times per week, upon completing a salon treatment. Can be used in combination with Cereal Blend Massage Oil – code 037 – 200 ml. Properties: Vitamin C is an excellent anti-oxidant factor, necessary for the development of collagen. It is recommended as a deep moisturizer in preventing skin ageing. With Omega Blue, which makes this formula suitable to hyper-reactive skins. Skin Type: Soothing and elastizing cream, suitable to intolerant, sensitive and reactive skins. Properties: Q10 is a bright anti-oxidant factor, having clear implications in the slowing of age and age related diseases. Recommended as anti-ageing for wrinkled but intolerant skins. Skin Type: Suitable to aged skins, intolerant to normal skin-care. Use: Apply every night on face/neck. Properties: Clearing and calming formulation, with Omega Blue, lineseed oil, ruscus and horse chestnut extract. Suitable to normalize iper sensitive skins, easy to irritate and get redded. Skin Type: Suitable to calm down hyper-reactive / stressed skins. Use: Apply regularly every morning. Properties: Body deodorant, with Omega Blue, for sensitive and intolerant skins. 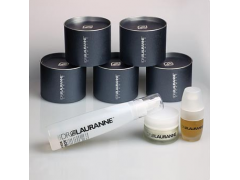 A special delicate formulation, free from preservatives, alcohol, aluminium and zirconium salts. Natural fragrance. Availalbe in spray form, or in milky emulsion form. Skin Type: Suitable to intolerant and sensitive skins. Use: Apply regularly every day, after shower. If necessary, repeat the application. Size: 200 ml – CODE 445 DEO MILK 200 ml – CODE 446 DEO SPRAY 200 ml. Properties: Milky wash, suitable to delicate / intolerant skins. Excellent as face wash, it can however be used also as body wash. With omega Blue. Skin Type: Suitable to skins reacting to normal soaps. Use: Use regularly for the daily face and body wash.
Properties: Oily wash, specifically formulated for cracked, reactive skins. Excellent as face wash, it is ideal also for body bath. Natural oil, free from preservatives, alcohol, aluminium and zirconium salts. Skin Type: Suitable to sensitive skins which are intolerant to normal soaps. Properties: Normalizing-restitutive cream for skin alterations. With Omega Blue and NMF ( source of Urea ), it is particularly suitable as a lenitive aid for dehydrated/desquamed skin. Skin Type: Suitable to intolerant and hyper-reactive skins. Use: Apply regularly according to personal necessities, in the morning as well as in the night.